Today, trans-seasonal pool heating is becoming even more commonplace, with a range of pool heating solutions to choose from, depending on your budget, location and lifestyle. Creating and maintaining the ideal pool temperature doesn’t come naturally. While pool water predominantly hovers around the 18-20 degree Celsius (around 64-68 degrees Fahrenheit) mark, it takes a designated heating system to bump it up to where we like it most – a balmy 25-29 degrees (77-84.2 degrees Fahrenheit). Installing the right pool heater can extend your swimming season by up to four months and beyond, thus increasing the return on what was undoubtedly a fairly large investment in your pool. There are three main heating options to choose from – solar, gas and heat pumps. Below is an overview of each type and their benefits. Undeniably the most environmentally friendly option of all, solar pool heaters operate by using the energy of the sun. 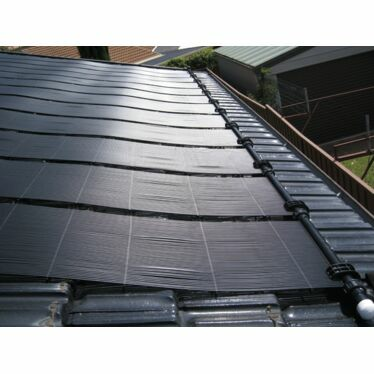 The principals involved in solar pool heating are very simple. Imagine a garden hose that has been lying in the sun for several hours. When you turn on the tap, out comes hot water. The sun’s energy has been absorbed by the hose and transmitted as heat to the water inside it. Basically the hose acts as a solar collector, which is the process of solar heating. Solar systems are a low cost method to heat up your pool and have virtually no operating costs, just the cost of electricity to pump the pool water through the solar absorber on the roof. 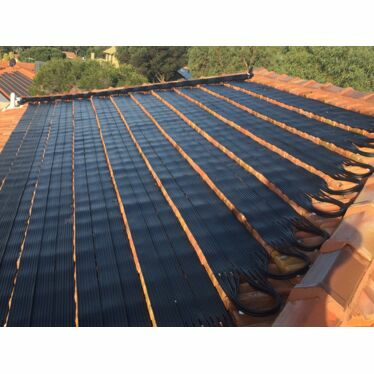 Solar heating systems are also simple to maintain. The quality of the collector system. Ultimately, the biggest influence is the exposure to the sun. This gives this system the advantage of being very cost effective in terms of running costs; savings that can keep coming for the whole 20 years a properly installed system can last. However, if you live in a climate that does not get a great deal of sunlight or a very shady suburb, then a solar system is not a viable option. Installation can also be costly; however some government rebates are available, so check on your local council or state government’s website. Reliable, highly efficient and economical to run, heat pumps extract heat from the air (similar to a reverse cycle air conditioner), and use that heat to produce hot water. Compared to gas and electric, heat pumps use just a fraction of the energy to generate the same amount of heat. Although initially heat pumps take longer than gas heaters to warm up the pool or spa water, they are much more economical and will then maintain the heating as well as gas heaters. 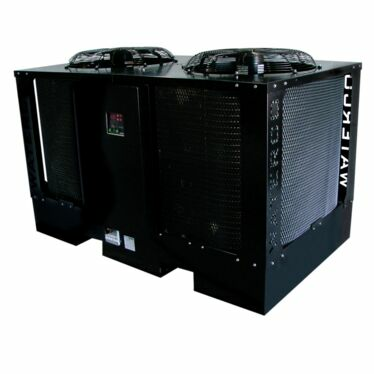 Benefits of heat pumps include their high energy efficiency and lower running costs. As a guide, you can save up to 80% over LPG and 50% over natural gas fuelled heaters. And the best thing about heat pump pool heaters is that they operate regardless of the weather. Another thing to consider is they can be expensive to initially install, but the low running costs will make up for this in no time at all.